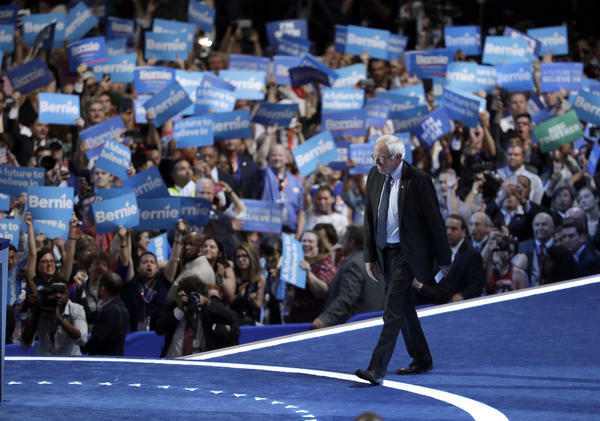 Former Democratic Presidential candidate, Sen. Bernie Sanders, I-Vt., takes the stage during the first day of the Democratic National Convention in Philadelphia , Monday, July 25, 2016. "Schadenfreude," said Philip Werlau, a Bernie Sanders supporter, when asked his feelings about this week's election results. "That is the German word for taking pleasure in someone else's misfortune. ... Because I don't want Trump to be president. But I'm happy that what I perceived as unfair tactics lost." Werlau, a 26-year-old computer science student from Florida, voted for Libertarian Gary Johnson in this week's presidential election, after supporting Bernie Sanders during the Democratic primaries. After Sanders lost the Democratic nomination, Werlau said there was no chance he'd support Clinton. "I kind of lost hope in the election," he says. And Werlau says his vote for Johnson wasn't a spoiler, because he "wasn't going to vote for Hillary in the first place." Werlau said he is still angry about what he thinks was unfair treatment of Sanders and his supporters by the Democratic National Committee. He and many others felt the nominating process for the party favored Clinton and that the DNC actively fought to make her the nominee. An email dump from WikiLeaks during the week of the Democratic National Convention this past July, which Sanders supporters say showed proof of the DNC tipping the scales in Clinton's favor, only confirmed those fears for many Sanders supporters. "It's far behind perception at this point, it's factual that the party leadership definitely put its hands on the scale for Secretary Clinton," said Dallas Fowler, a Sanders delegate turned Clinton voter from Los Angeles. "And I think post-primary not dealing with that effectively as a party drove a number of people [away from Clinton]." Fowler, like most Sanders supporters, eventually ended up backing Clinton in the general election. The conventional wisdom was that Clinton could get most disaffected Sanders voters back if she moved further to the left after the convention. And she did, most notably with a college affordability plan Clinton announced after clinching the nomination, which borrowed heavily from Sanders' agenda and was critical in securing the Vermont senator's endorsement. But for some Sanders supporters, and maybe enough of them to swing the election, nothing Clinton could do would win them over. Zach Exley was a senior adviser to the Sanders campaign and the author of the upcoming book, Rules For Revolutionaries. He says Clinton's problems were bigger than policy, or any sense of betrayal from core Sanders supporters. For him, it was about tone. "Americans are so angry about their incomes going down for the past 40 years, they wanted to see that anger reflected in a leader," said Exley. "And Trump had that and Bernie had that, and Clinton seemed not to know what the rest of us are going through." Dallas Fowler says that because Sanders proved he could tap into that emotion, he could have won several states Clinton did not. Listing states like Michigan, Florida and Pennsylvania, Fowler said, "The polls that were right about this outcome [Trump's win] in May and June of this year, those same polls had Sanders winning by a ten percent margin." Of course, those polls could not take into account any attack ads that might have been run against Sanders in a general election campaign; during the primaries only a few opposition ads were run against him. Sanders himself issued a statement soon after Donald Trump's victory, saying, "Donald Trump tapped into the anger of a declining middle class that is sick and tired of establishment economics, establishment politics and the establishment media." But Sanders also said he would be open to working with the new president, "To the degree that Mr. Trump is serious about pursuing policies that improve the lives of working families in this country." But he concluded, "To the degree that he pursues racist, sexist, xenophobic and anti-environment policies, we will vigorously oppose him." "I'm not even thinking about Donald Trump at this point, candidly," she said. Instead she's looking forward. "The 2018 midterm races are winnable," Wong said. "We can win it all in 2018. And I think that's what we have to look forward to. We can't just dig in and think that it's all over, because it isn't."